John Edward Sache was one of the more prominent 19th century European photographers in India. He began his career in America and then surfaced in Calcutta in 1865, where he formed a partnership with Westfield. He worked in Bombay in 1869, and then with Colin Murray until 1870. 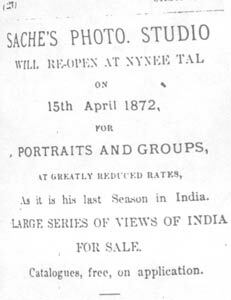 During the 1870's, Sache ran studios in Lucknow, Naini Tal, Meerut and Mussoorie. 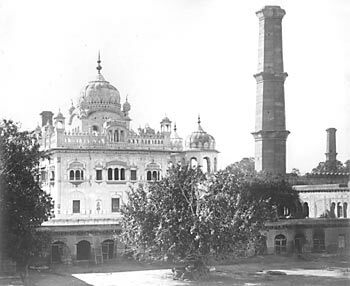 Sache left India in the early 1880's. Although a successful photographer, he is reputed to have copied photographs first taken by Samuel Bourne, re-photographing locations so precisely that they seem like original Bournes. Photography was often a family occupation in the 19th century. Alfred Sache, probably a son or nephew, ran a studio in Lahore in the 1880's. Brother-in-law William D. Holmes joined John Sache in Lucknow in 1877. In 1889 W.D. Holmes founded Holmes Studio in Peshawar, the premiere British photographers in the Northwest Frontier Province for half a century. The studio was taken over by Randolph B. Holmes, who also opened a branch in the cantonment of Nowshera in 1910. Both Holmes were important military and civilian photographers, who recorded the history of the Frontier with deep affection and skill. Sache PhotoIndex #: 90, 91 [Sache & Murray], 128,143, 152, 178, 153, 166, 17?, 19?, ?,32?, 322, 330, 331, ?, ?, ?. Sache's photographs were the subject of an exhibition by The Alkazi Collection of Photography.